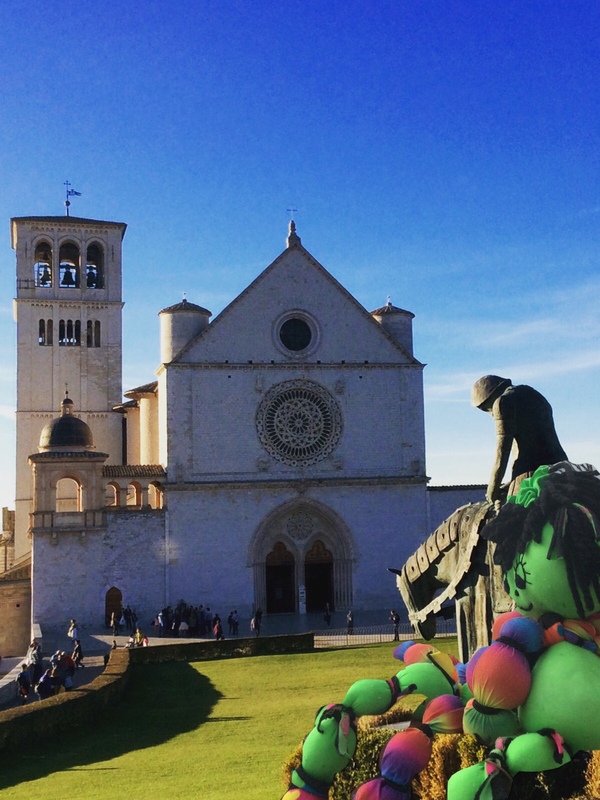 Georgie really wanted to visit Assisi. It's very near to Castel Rigone and her cousins were always visiting and sending her lots of photos. They said it was one of the most beautiful and magical places in Umbria. Georgie enjoyed the drive to Assisi very much. The roads were very quiet and weaved in and out between fields and olive groves. 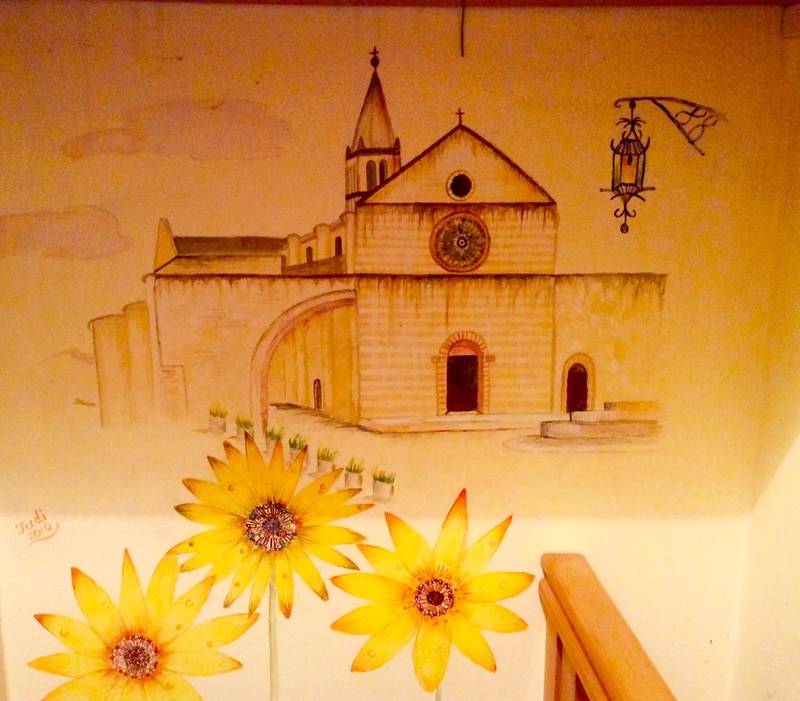 At first the town was just a speck of white on the hillside and then, as they drew nearer Georgie couid see the pale pinky white stone houses and the magnificent Basilica of St. Francis. 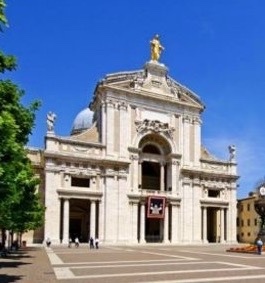 They stopped first at the base of the hill to visit he magnificent church of Santa Maria degli Angeli. Georgie had never seen such a huge church! She had to walk right to the back of the car park to take a photograph and nearly fell over looking up. It was so high ! The church was beautiful. Georgie really liked the rose garden and the tiny church inside the main church which looked like a dolls house but her favourite was the statue of Saint Francis holding a dove. She got quite a fright when the dove blinked at her. It was real! On leaving Santa Maria degli Angeli they drove up the hill to the main town of Assisi and walked past the Church of Santa Chiara. 'I'm sure I've seen this somewhere before, ' said Georgie. 'Yes, you have,' said her cousins. 'It's painted on one of the walls of our house! ….. and so it was! 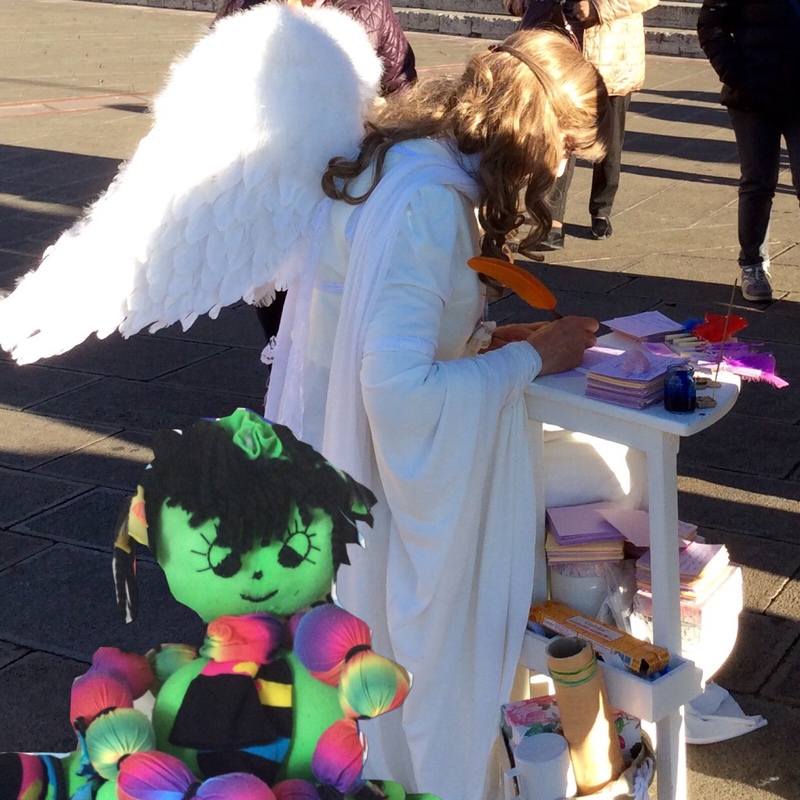 It's not very often you meet an angel but Georgie met one in Assisi! . 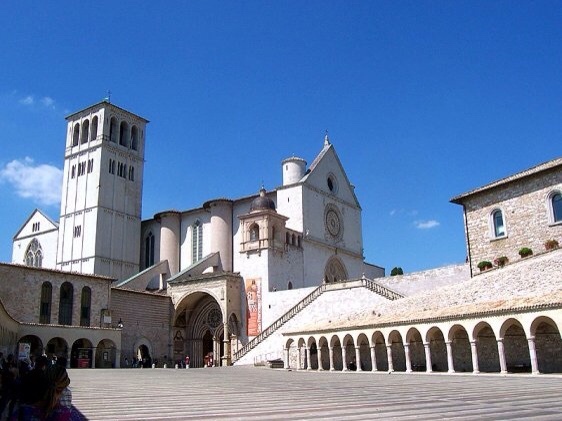 Next they visited the Basilica of Saint Francis which is actually two churches one on top of the other. Both are magnificent but the huge vaulted ceilings of the lower church left Georgie speechless. Every centimetre was covered with paintings. 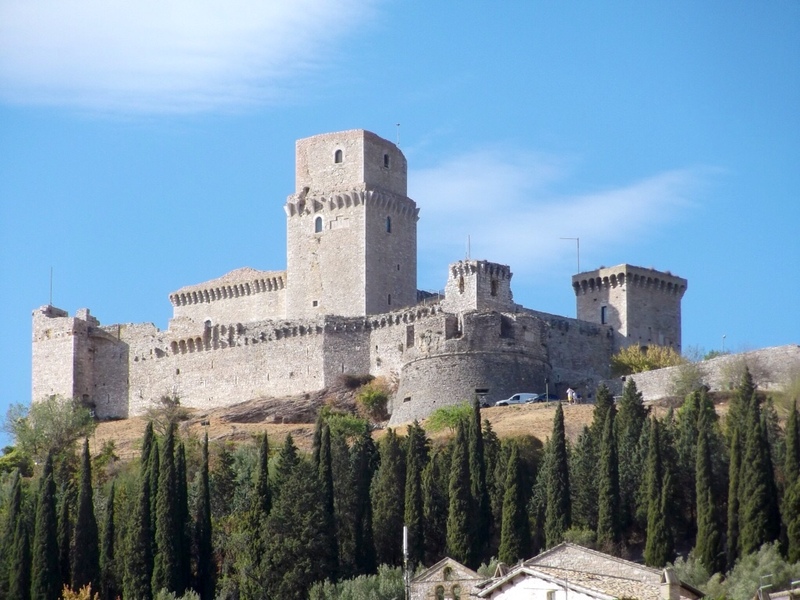 Their day in Assisi concluded with a walk to the largest of the towns two fortresses, the Rocca Maggiore. 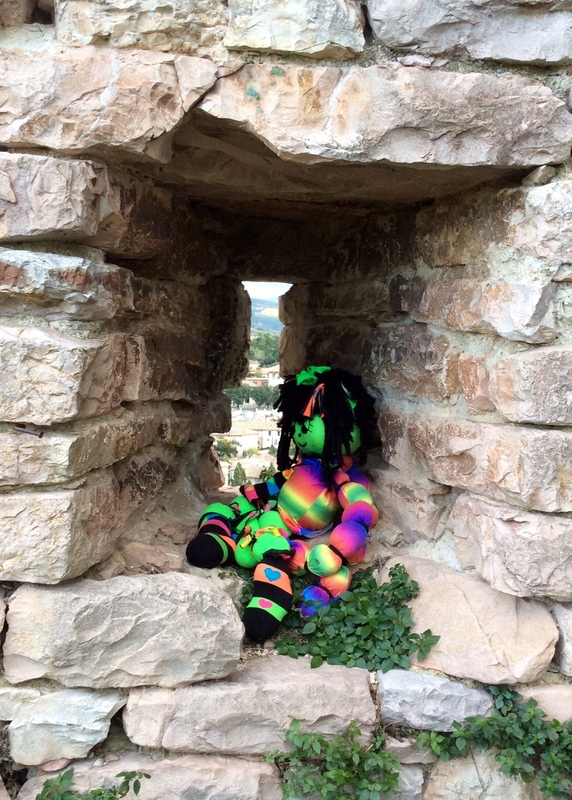 The views from the top were amazing and Georgie had a great time in the gardens. 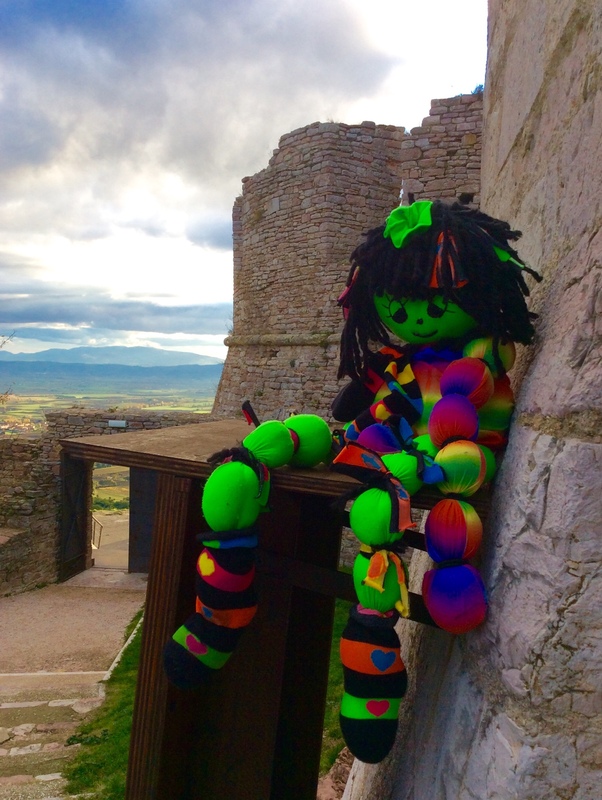 It was getting too late to go into the museum and walk along the walls of the Rocca but Georgie really hoped they could return and do this on another day. It looked like fun. The day had been wonderful but one day in Assisi is just not enough! There are so many more things to. So many more places to visit. Your pictures bring back wonderful memories! I’m so glad Ishita! 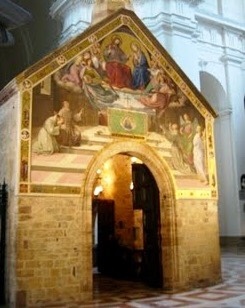 Assisi is the most magical place. Unfortunately most people only see the main sights and miss the quaint little streets, the upper town and the Rocca. I love it also in the evening when bathed in golden light. I’m hoping to go back next week for the Living Nativity.